Unisys Security provides experienced consulting, advanced products, and efficient managed services that can combine to deliver dramatic improvement in security posture and operational efficiencies. Join fellow security executives for a roundtable discussion over the necessity and importance of staying secure in a dynamically evolving and competitive landscape. 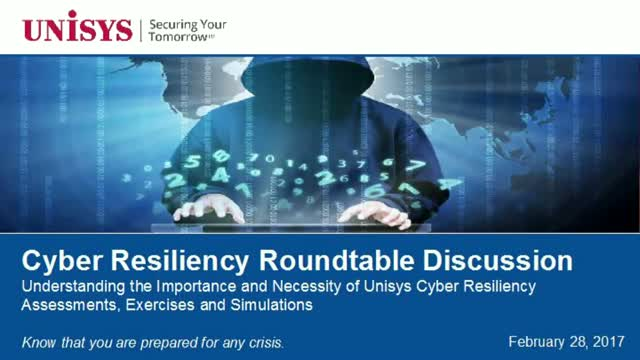 The cyber resiliency assessments are based on the U.S. Department of Defense’s mission-critical procedures and Unisys’ commercial best business practices. They provide an unbiased 3rd party expert assessment of the client’s Incident Response Capabilities, deliver a Security Enhancement Playbook, and identify the gaps in their cyber defense network that leads to improved cyber resiliency. - How to enhance adaptability to the unanticipated and the capacity to emerge from a crisis faster with less damage to profitability, brand and customer loyalty. We will also discuss how crisis-preparedness exercises help your team experience real-world threat scenarios in order to assess the team’s ability to address, contain, respond and mitigate security threats. FinTech: Big Data, Bigger Security Risks? FinTech relies on big data to bring you more insights into your money and financial health. However while there are a lot of opportunities there are also a lot of challenges to big data in the financial sector, from how to deal with data overload, how to store and manage all this data and how to keep it secure. Please join me for a FREE 30 minute webinar that outlines ways to learn scale and security with Amazon Web Services (AWS) and Unisys. • Why are organizations transforming? • What can practitioners do to easily migrate to the Cloud? • How can I rapidly prototype scale and security in context to my own on-premise environment? • How can I automate security and scale for all my stakeholders?